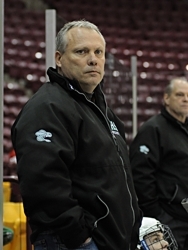 Former NHL defenseman Curt Giles guided the Hornets to the Class AA title last winter (Photo by Tim Kolehmainen). Edina coach Curt Giles typically doesn’t show a lot of emotion. Regular season win? Ho hum. Regular season loss? Same reaction. Giles’ even-keel demeanor is reflected in his team, which typically turns in a consistent, workmanlike performance night after night. After the Hornets beat Burnsville for the Section 2AA title and a fifth straight trip to the state tournament, Giles was asked if the excitement ever diminishes for a team that goes to the state tournament year after year. Giles, in his response, lit up with emotion. At least by Giles’ standards. A year ago, after a ho-hum regular season, the Hornets found another gear in the section playoffs, then downshifted again at the state tournament. They won the state Class 2A title with a 4-2 triumph over Minnetonka, the state’s No. 1-ranked team for most of the season. The Hornets could very well be on the same trajectory this year. No. 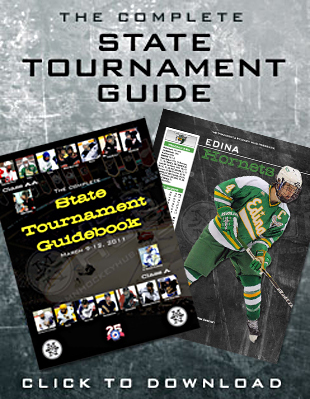 2-seeded Edina (18-7-2) plays unseeded Blaine (20-4-4) at 11 a.m. on Thursday, March 10, in the opening round of the state Class 2A tournament at the Xcel Energy Center in St. Paul. Edina suffered three straight losses in what has become an annual January swoon. The Hornets then finished fourth in the five-team Lake Conference with a 4-4-0 record. Not to worry. It’s the postseason that matters for a program that has won seven state titles, 10 if you include the three won by Edina East when the town had two high schools. “You don’t want to let the city down,” said Hornets senior Jake Sampson, who scored the winner in the closing minutes against Burnsville. “Every practice, every day you look at (the championship banners at Edina’s Braemar Arena). And you just say you want to be a part of it. The Hornets return most of the key components from last year’s championship team. Senior goaltender Connor Girard, who was outstanding during last year’s stretch run, has a 12-6-2 record, 2.60 goals-against average and .894 save percentage heading into the state tournament. Senior defenseman Max Everson, who both dislocated and broke a bone in his wrist in a Feb. 10 triumph over Minnetonka, isn’t at full strength but is back in the Hornets’ lineup and fully capable of playing a shutdown role. Everson, one of 10 Mr. Hockey finalists, has commited to play at Harvard next season. Another Mr. Hockey finalist, senior forward Steven Fogarty, gives the Hornets a game-breaking offensive threat. He has 25 goals and 47 points, both team highs. Edina’s players, like their coach, are eager for what lies ahead. Most of the top players from Edina’s state championship team a year ago have returned, so there’s no reason to think the Hornets can’t make another championship run. Few teams can match Edina’s depth, as the Hornets’ have goal scorers stashed on all three of their top forward lines. Curt Giles, a former defenseman with the Minnesota North Stars, has two other former NHLers on his staff in Dave Langevin, who won four Stanley Cups with the New York Islanders, and Don Beaupre, a former North Stars goaltender. You want high school hockey history? Come to Edina. From Bill Nyrop to Paul Ranheim to Anders Lee, the players who have donned the green and white jerseys hold a special place in Minnesota hockey lore. Even those not so easily remembered are fondly recognized at Braemar Arena by murals, plaques and banners paying homage to teams past. Heck, the place sits on Ikola Way, a nod to coach Willard Ikola’s 616 victories in 33 years as head coach. The defending 2A champion Hornets are playing in their 27th state tournament, a number that includes five appearances as Edina East in the 1970s. The banners hang behind the far goal at Braemar. Sampson’s 11th goal of the season — and third of the playoffs — came with 71 seconds left against Burnsville in the Section 2 final last week and got Edina back to the state tournament for the fifth consecutive year. The Hornets received the No. 2 seed and kick off the Class 2A tournament at 11 a.m. Thursday against Blaine at Xcel Energy Center. Sampson has a knack for this sort of thing. He had the primary assist on Ryan Cutshall’s goal 26 seconds into the state championship game last season, ultimately won 4-2 by the Hornets. He then netted the eventual game-winner 13 minutes into the second period. The, ahem, buzz that surrounds the Hornets and the other teams at this time of year is immeasurable. But it goes beyond general excitement. At this time of year, experience helps. Blaine has an impressive streak, too. The Bengals are at state for the sixth consecutive year, though they have advanced out of the quarterfinals once in the past five years. Edina’s experience at state was a factor in its return, Giles said. Edina fell behind 2-1 just 15 seconds into the third period against Burnsville before rallying late.